James Graham, Marquis of Montrose had been appointed Royalist commander in Scotland in Summer 1644 and had won numerous victories against the Covenanters who had sided with the English Parliament against the King. At the Battle of Alford (1645) Montrose continued this trend when he engaged and defeated the final Covenanter army in northern Scotland. Throughout Summer 1644 James Graham, Marquis of Montrose waged a successful campaign in Scotland on behalf of King Charles I. The Scottish Government was controlled by Covenanters who had fought the King over his religious policy in the late 1630s but, until August 1643, had remained neutral in the English Civil War between Charles and Parliament. This changed after a sustained diplomatic effort by the Parliamentarian John Pym on the promise that Presbyterian doctrine would be introduced into England. Scottish forces crossed the border in January 1644 under the command of Alexander Leslie, Earl of Leven and played a key role at the Battle of Marston Moor (1644) which saw the Royalists in northern England decimated. That same Summer, King Charles appointed Graham as Captain General in Scotland tasked with fighting the Covenanters in their home territory and causing their withdrawal from England. At the start of his campaign Graham had few men and little equipment. However he exploited the widespread distrust amongst the Highlanders of a key Covenanter - Archibald Campbell, Marquis of Argyll - which ensured he assembled a fledgling force. At the Battle of Tippermuir (1 September 1644) he had captured stocks of weapons and gunpowder facilitating his assault on Aberdeen later the same month. Early in 1645 he achieved a number of victories against Covenanter forces starting with the Second Battle of Inverlochy in February 1645 where he defeated Campbell with a stunning advance over the Ben Nevis mountain range. Following the victory at Inverlochy, Montrose marched his force along the Great Glen to Inverness and then on towards Elgin. Here his small army was augmented by 500 troops from the Gordon and Grant clans enabling him to go on the offensive again. He occupied Aberdeen and from here launched attacks on Brechin and Dundee. He attacked the latter on 4 April 1645 but, alerted to the raid, a Covenanter army under Lieutenant General William Baillie marched north from Perth. The Royalists retreated just in time - allegedly leaving the town via the East Gate as Baillie marched in via the West Gate! Major-General Sir John Hurry was sent in pursuit of Montrose with a Covenanter army but was defeated at the Battle of Auldearn on 9 May 1645. With Hurry beaten, Montrose sought to destroy Baillie's army in order to be able to focus his efforts on taking control of the Scottish central belt. Baillie was now commander of the sole Covenanter force in Scotland but was subject to the direction of the Committee of Estates, the governing body of Scotland. Unnerved by the success of Montrose, the Committee decided to create a second army and detached around 1,200 experienced troops from Baillie reducing his infantry by half. He was compensated with new recruits but nevertheless the experience of his force had been greatly reduced. Furthermore the new Covenanter army, which was commanded by Lord Lindsay, did not operate in partnership with Baillie. Fully aware his army was now in no position for an encounter with Montrose, Baillie spent the rest of May and much of June avoiding the Royalist General. Pursued across Moray and Aberdeenshire, Baillie successfully evaded contact. 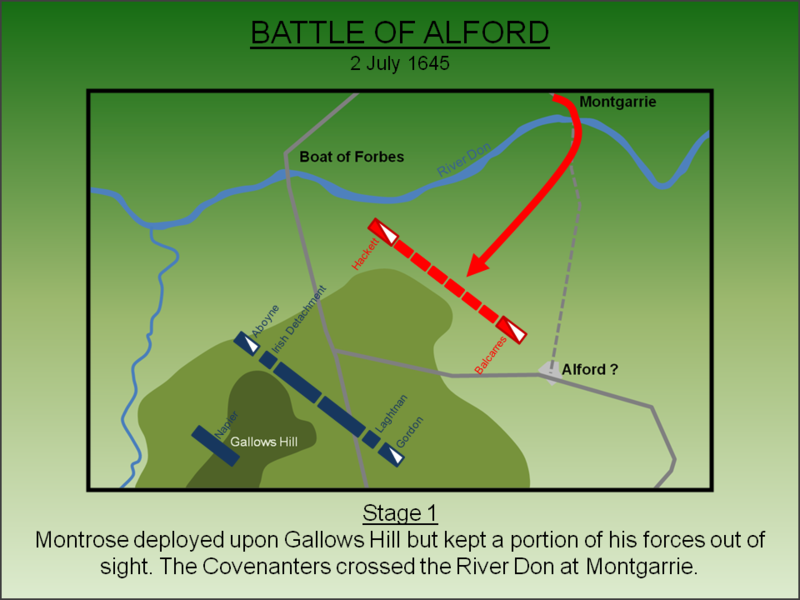 Montrose finally caught up with Baillie on 24 June 1645 near Keith. Now more confident in his forces - and believing Montrose to be in a similarly depleted state - Baillie drew up for battle and occupied a formidable defensive position. Montrose did not take the bait and an uneasy standoff followed. On 1 July 1645 Montrose sought to dislodge him by crossing the River Don and threatened an advance south. The Royalists then occupied Gallows Hill - a particularly strong position overlooking the crossing of the River Don at the Boat of Forbes - and waited to see if the Covenanters followed. Baillie now had little choice but to pursue otherwise the Royalists would have had an unopposed march into Central Scotland. The Covenanter force, under Lieutenant General William Baillie, consisted of two Regiments of Horse (Balcarres and Halkett) and six Regiments of Infantry (Cassilis, Callendar, Elcho, Glencairn, Lanark and Moray). However, despite the composition of the force being well recorded, the actual numbers are uncertain. Around 1,200 troops had been re-allocated to Lord Lindsay's army and may only have been replaced by 400 raw recruits. Accordingly it is probable Baillie's infantry was smaller than that available for Montrose and was certainly less experienced. This was the view of Baillie himself, albeit writing after his defeat, where he suggested he was heavily outnumbered in infantry. 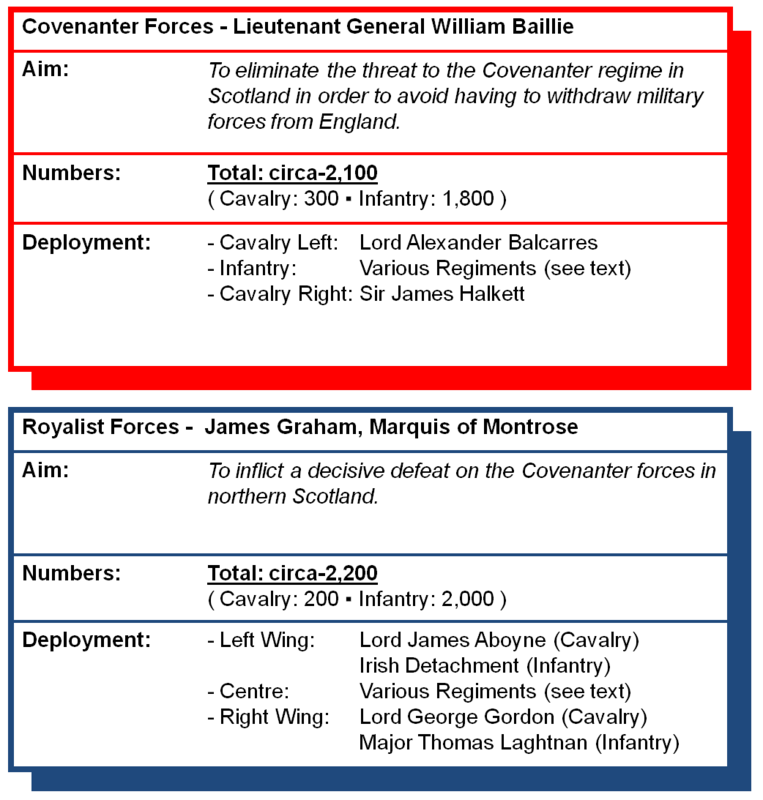 Some modern historians suggest the Covenanter army was actually the larger of the two forces but, given the sequence of events in the later battle where the Covenanters stretched their infantry line out, this seems unlikely. The Royalists - under James Graham, Marquis of Montrose - were in a significantly better position. Although MacColla was detached recruiting more men, Lord Gordon had joined the Royalist ranks bringing a significant cavalry detachment with him although this was smaller than the numbers available to the Covenanters . The Royalist infantry comprised of men from the Strathbogie regiment, Colonel Farquarson of Inverary's regiment, MacDonald Highlanders and Manus O'Cahan's Irish companies. The battle was fought on the 2 July 1645. Montrose positioned the bulk of his forces on the western slope of Gallows Hill to conceal them from Baillie but whether this encouraged the Covenanter General to attack or not is unknown. Furthermore it is unclear whether Baillie actually intended to commit to battle or was simply planning to flank round Montrose's position to bar his advance south. Some authors suggest Montrose's deployment had tricked Baillie into thinking the Royalists were departing and it is also possible that Baillie was pressured into battle by Balcarres who was not only his cavalry commander but also a member of the Committee of Estates. Montrose's position gave him a clear view of the river crossings at Bridge of Forbes (immediately to the north of Gallows Hill) and Montgarrie. Given the dominant Royalist position over the former, it can be presumed that Baillie opted to use the crossing Montgarrie although the first map of the region, dated from the eighteenth century, does not show a major road on this route. 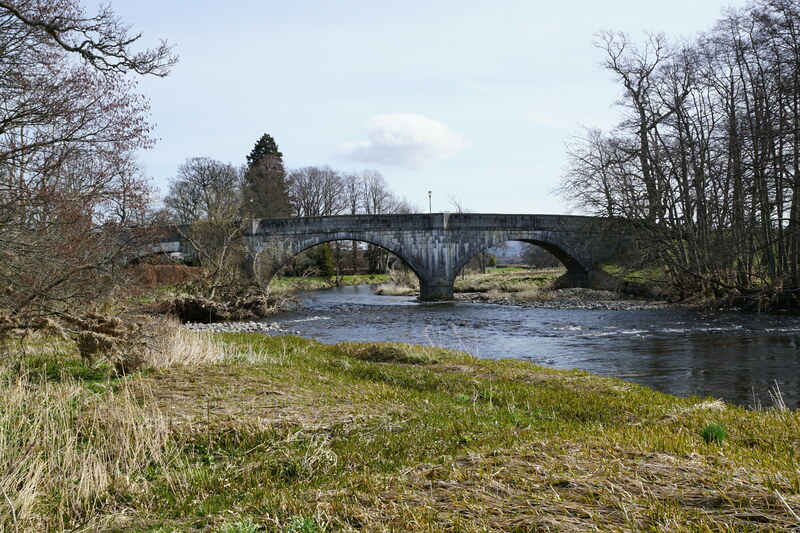 The first units to cross the River Don were the cavalry under Lord Balcarres. 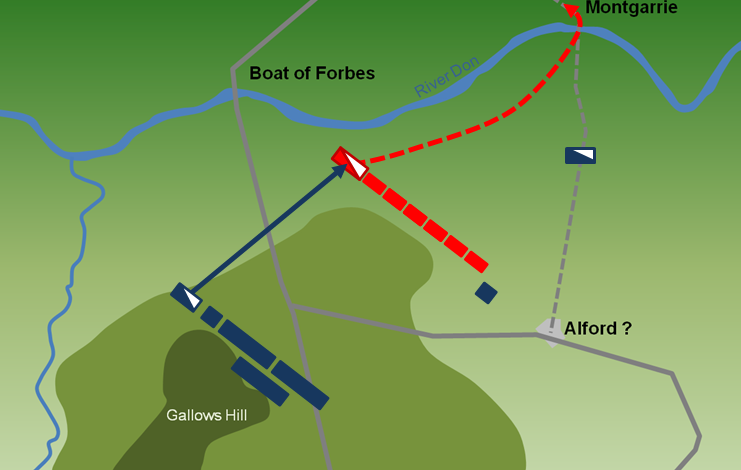 It is not clear whether Baillie deployed his forces in battle array prior to the fight starting or even if he had sufficient time to move all his forces across the River Don. Either way Lord Balcarres found himself opposite the Royalist cavalry of Lord Gordon who charged against him. However, Balcarres' men were veterans of the war in England with many having fought at Marston Moor. They held against the Royalist charge, presumably aided by their superior numbers, and repulsed Lord Gordon. Having been initially driven back, the Royalist right re-grouped and launched a combined assault with their supporting infantry detachment under Laghtnan. This coordinated attack broke Balcarres' force who retreated. If previously uncommitted to battle, Baillie now had little choice but to continue the engagement. His second cavalry detachment, under Sir James Halkett, advanced and was attacked by the Royalist left under Lord Aboyne. The Covenanter force was broken and fled the battlefield. Once the Covenanter infantry had crossed the River Don, Baillie extended the line to ensure he was not outflanked. The net effect was his infantry was just three ranks deep vice six for the Royalists. Sensing their weakness Montrose sent his infantry forward using a Highland charge - a full speed dash towards the enemy line, discharging weapons at short range and then closing into a melee with traditional weapons. Whilst experienced soldiers may have held against this onslaught, the raw recruits of Baillie's force succumbed. The Covenanters were pushed back towards the crossing at Montgarrie. As the Covenanter infantry buckled under the pressure of the frontal assault a portion of the Royalist cavalry, under Lord Gordon, returned to the field and joined in the attack. Gordon's charge, in which he was shot dead allegedly by one of his own men, broke the Covenanter infantry. The troops fled the battlefield and were remorselessly pursued by the Royalist horse with many slaughtered - some accounts suggesting over one thousand men died in the retreat. Baillie, who had escaped the battlefield, offered his resignation to the Committee of Estates and, although accepted, he was obliged to continue until his replacement arrived from Ireland. Having already hamstrung their General, the Committee now appointed a deputation to advise Baillie on tactics. Given those appointed had already been defeated by Montrose, such advice must have been of limited value! 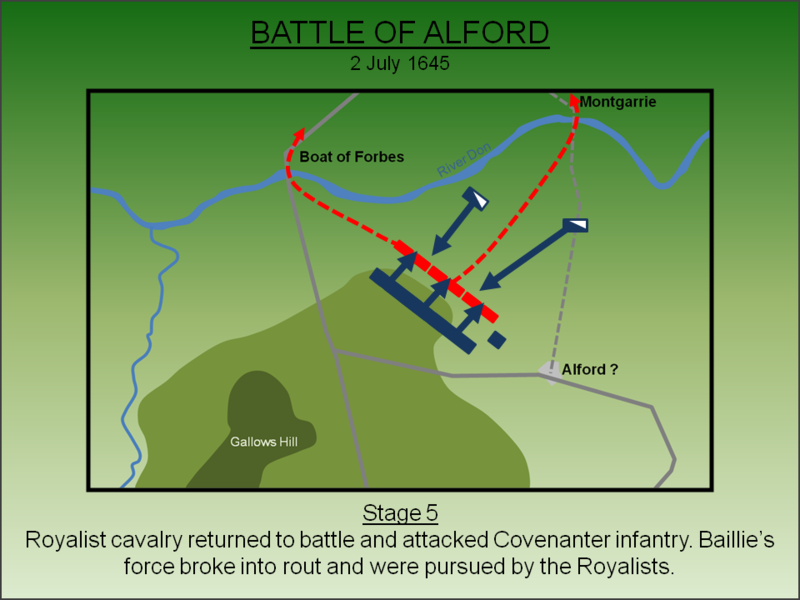 For the Royalists Alford was another significant victory for Montrose and doubtless would have been greeted with great relief by Charles I who had seen his English field army destroyed at Naseby just two weeks earlier. However Montrose had lost a close ally, Lord Gordon, which weakened his future support. Nevertheless, Montrose was now the master of northern Scotland enabling him to march south where, the following month, he achieved his greatest success at the Battle of Kilsyth. After that decisive victory he briefly became master of all Scotland summoning a Parliament in Glasgow. However, with the local forces having failed to neutralise Montrose, the Scottish army in England was recalled. Major General Sir David Leslie marched north and in September 1645 he cornered the Marquis near Selkirk. At the Battle of Philiphaugh, the most successful of Royalist Generals was finally defeated. Baillie, R (1841). The letters and journals of Robert Ballie. Ogle, Edinburgh. Foard, G (2005). Alford 1645. The Battlefields Trust. Lancaster, J.H.D (2015). Alford: Battlefield visit notes and observations. CastlesFortsBattles.co.uk. Napier, M (1856). Memoirs of the Marquis of Montrose. Stevenson, Edinburgh. Nelson, R (1913). Maps and plans of the Battles of Aberdeen, Alford, Auldearn and Kilsyth. T.Nelson and Sons, London. Ordnance Survey (2015). Alford. 1:1250. Southampton. Simpson, W.D (1919). 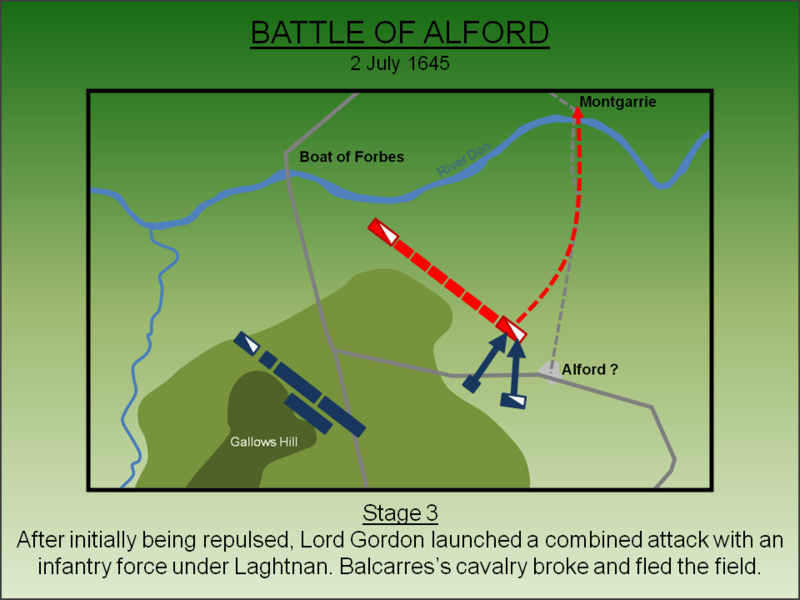 The topographical problem of the battle of Alford. Aberdeen University Review. There is no battlefield trail or monument (other than the Gordon Stone) but there is good access to the site via major roads with footpaths or minor roads that are (relatively) safe for pedestrians. Walking from Alford to the Bridge of Forbes along the A944 covers the ground where the bulk of the action took place and Gallows Hill, from where Montrose deployed, is clearly visible to the west. Diversions can be made along the A980, to see the rear of Montrose's position (where he hid the bulk of his forces), and to Montgarrie where it is most likely that Baillie crossed the River Don. Bridge of Forbes. It is often assumed Baillie crossed the River Don at the bridge at Forbes but this would have been suicide given the proximity of Montrose. If another crossing existed, which it probably did at Montgarrie, it is highly likely that he used that. River Don. 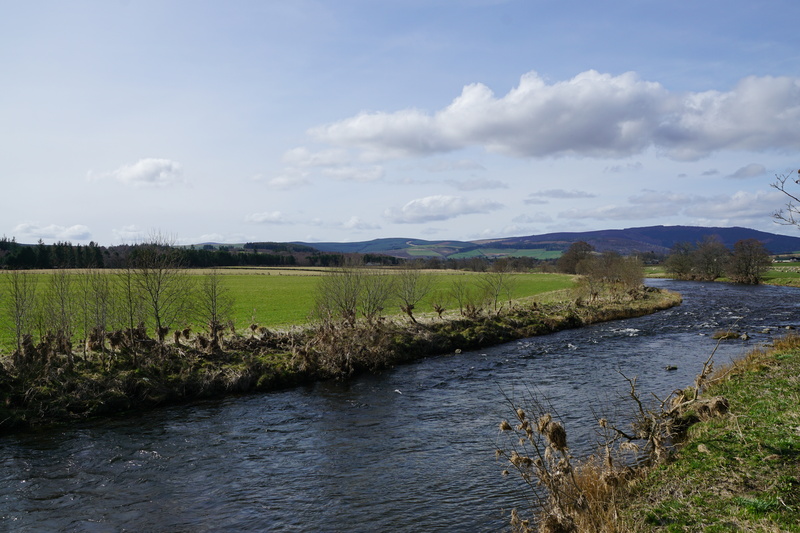 The fast flowing River Don could not be forded in vicinity of the battlefield. Gallows Hill. Gallows Hill viewed from the Bridge of Forbes. Montrose had occupied the summit and controlled the adjacent road. Gallows Hill. Gallows Hill viewed from the rear of the Royalist position. Montrose hid a portion of his forces here hoping to entice Baillie into crossing the River Don and attacking him. Montgarrie. 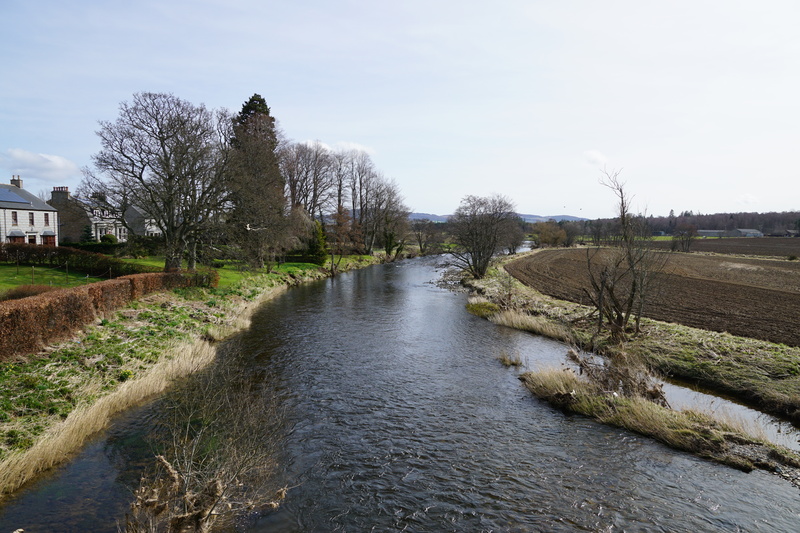 The River Don in vicinity of the crossing at Montgarrie. Gallows Hill can be seen in the distance. It is not certain whether a road existed at Montgarrie at the time of the battle. Gordon Stone. Lord Gordon was a key supporter of Montrose who had successful recruited many men in support of the Royalist cause. He was killed in the closing stages of the battle allegedly by an (accidental) shot from his own side. 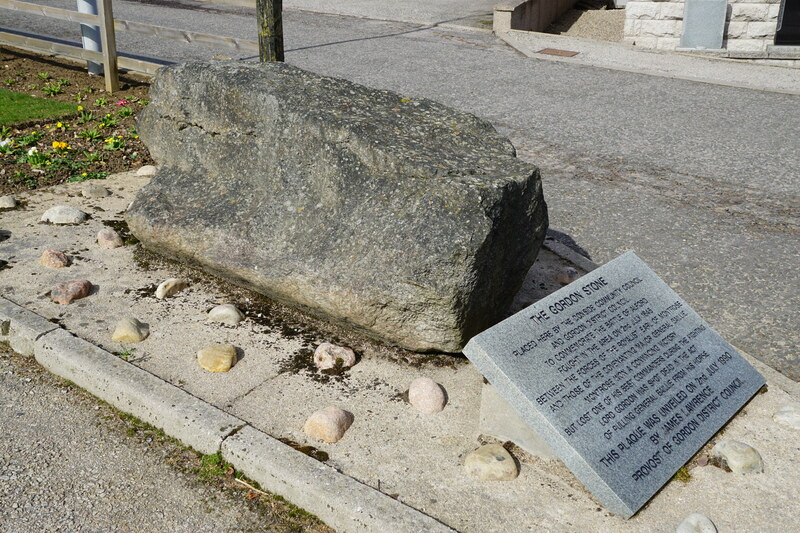 There is a car park in Parkhill Lane at the north-west end of Alford which is directly adjacent to the Gordon Stone. Bridge of Forbes and Montgarrie can both be visited on foot or by car - for the latter on-road parking is possible at both locations. A lay-by near Alford Kirk allows a short walk up the western slopes of Gallows Hill.